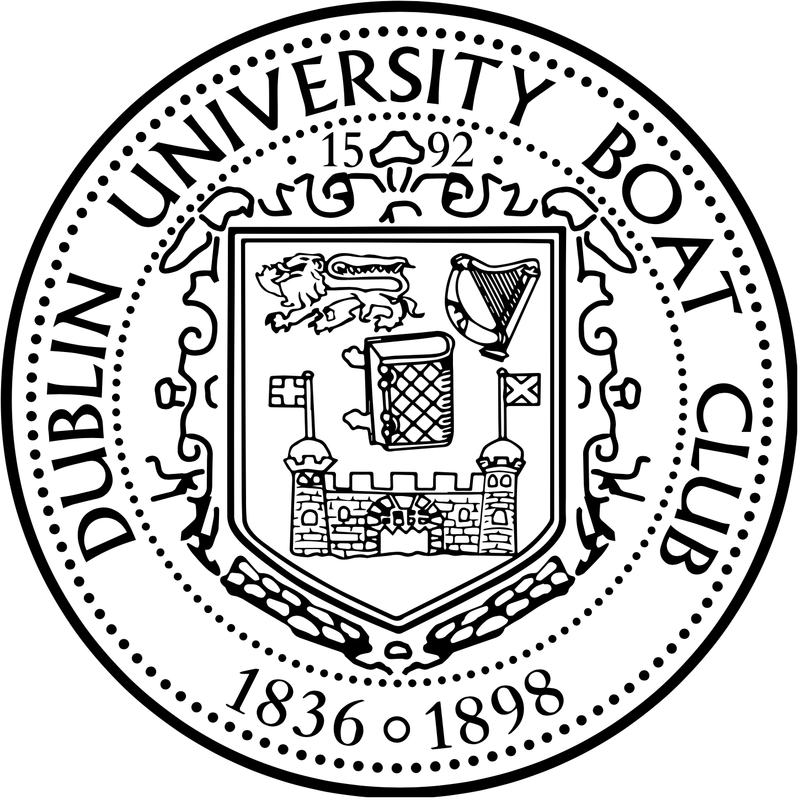 The colours of the Club shall be Black and White, carrying the armorial bearings of Trinity College Dublin on a Royal Blue Shield, and the tie shall be broad diagonal black and white stripes, with a very narrow blue stripe in the centre of the white. The tie shall be of silk or poplin, the black stripe width 1 1/8 ins. The white stripe, which shall be plain white in colour, shall be 1 in. wide. This measurement includes the blue stripe of one-sixteenth in. width which is in the centre of the white. The singlet shall be of white cotton buttoning down the middle, trimmed with 5/8 in. black ribbon on neck, sleeves, and middle opening. The socks shall be black and white horizontal stripes, each 5/8 in. wide. The sweater shall be cable stitch with the Club colours round the neck, bottom, and sleeves. The colours shall be arranged as follows:- four stitches black, three white, one light-royal, three white, four black. The flannel muffler shall be striped lengthwise. Length 90 ins., widths: black 10 ½ ins., white 5¼ ins., blue 1¼ ins., white 5¼ ins., in that order. The scarf shall be of wool with coloured transverse stripes as follows:- 3¾ ins. black, 1¾ ins. white, ¼ ins. Blue, 1¾ ins. white, width 11 ins. Tassels, six black, three white, one blue, three white, six black, in that order at each end. Black stripes at the end, eight black stripes in all. The blazer shall be of black flannel, with white cord piping round the edges and above the cuff. Three large silver buttons on the front, and four small silver buttons on the cuff. No dates or initials shall be worn. The badge shall be worn on the pocket, and shall be 4 ins. high by 3 ins. wide. The lion, harp and book in gold wire on a flat pad of royal blue. The shield trimmed with gold wire. The castle in silver. The flags red on silver. The waistcoat shall be of black flannel with white cord piping, having four pockets without piping. Five small silver buttons. The sweater shall be of white cable stitch with or without sleeves, trimmed round V only in black flannel, width of trimming 3 ins. at sides, 5 ins. at bottom. Badge in cloth, sewn on trimmings in front at bottom of the opening. The cap shall be black bearing two oars, crossed with the blades downwards, in white art silk, surmounted by the badge in cloth. The letters D.U.B.C in white arranged as shown, in Gothic capitals. A chevron of three black threads on each blade as shown. The buttons of the oars outlined in black thread. The dress waistcoat shall be of cream wool gabardine, single breasted but with double-breasted lapels, front and pockets. Three Boat Club silver buttons. The blanket flannel trousers shall have a 2 ins. turn up, 2½ ins. band and belt loops, also two side and one hip pockets. Width of bottoms as desired. The singlet shall be black and white horizontal stripes, each 1½ ins. wide, buttoning down the middle. The tie shall be of royal blue flannel. The blazer shall be of white flannel with black cord piping. Three large black buttons in front and three small ones on the cuff. The same badge as on the Senior Blazer. The cap shall be white with black silk oars, crossed with the blades upwards. A chevron of three white threads on the blade, and capitals in black. The dress waistcoat shall be bound with black silk braid and have black buttons, the other details the same as the senior dress waistcoat. The blazer shall be black and white flannel in vertical stripes, each stripe shall be 2 ins. wide. Black cord piping shall be used, and three large black buttons in front and two small ones on the cuff. The same badge as on the Senior blazer. The cap shall be black and white concentrically striped. The badge, oars and lettering the same as on the Junior cap. Senior colour men are entitled to wear the Senior blazer, sweater, cap, waistcoat, dress waistcoat, tie, singlet, and blanket flannel trousers. Those who have rowed on the First Eight, but have not been awarded their colours, may wear the Senior singlet without badge, and the Senior tie at the discretion of the Captain. Junior colour men are entitled to wear the Junior blazer, cap, and dress waistcoat. Maiden colour men are entitled to wear the Maiden blazer and cap. All colour men representing the club at a public regatta must wear the badge on their singlets. No other member is entitled to wear the badge. The flannel muffler may only be word by those who have been awarded their colours. All members are entitled to wear the Boat Club singlet, sock, sweater, tie, and woollen muffler. Every member who goes out in a boat which is the property of the Club, or in a crew representing the Club, must be respectably dressed in a Boat Club singlet, socks, and white shorts. All colour men must wear a Club, or else a plain white, sweater. 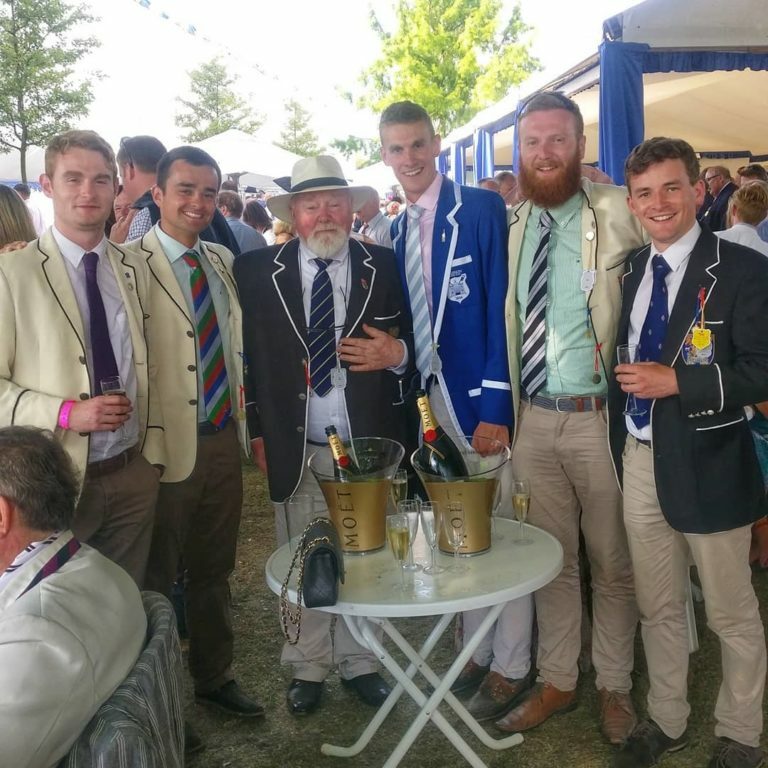 At public regattas all coxswains must wear the blazer and cap to which they are entitled, and white trousers. Specimens of the flannel for the Senior tie and the Senior blanket flannel trousers shall be kept by the Honorary Secretary for reference. Messrs. Seales and Tysons have each two dies, one large and one small, of the Club buttons. These dies are their own property.